Transfolk are emerging as a vital part of the pride tradition. Pride Week is all about...well...pride, right? But what kind of pride are we talking about? Most people commonly associate Pride Week with a celebration of sexual diversity---a celebration of the freedom to be with whomever we want, male or female. But Pride Week is not just about sexual orientation. It's also about the expression of gender. For local transfolk, Pride Week is about celebrating the freedom to express their gender in whatever way they want. It's a different kind of celebration than the "LBG" side of things, because it's not about liking boys or girls, it's about being boys or girls. The trans community itself is a diverse crowd. That's why the word "trans" is handy---it takes in a whole bunch of identities under its umbrella, including transgendered and transsexual, words that spark plenty of debate about their definitions. For the most part, "trans" is an inclusive way to reference anyone transitioning from one gender to another, or questioning their gender identity in some way. Some transpeople are straight; some are gay. Some take hormones and have surgery; some don't. Some live their whole lives identifying as transmen or transwomen; others identify only as the gender to which they've transitioned; others still assume no gender titles. One thing Haligonian transfolk have in common? They are a part of some big changes locally---and globally. Transpeople will tell you that their coverage in the media tends to be spotty and misleading. The world seems to barely understand or recognize trans issues at this moment in history. But Canada is making progress. On Friday, June 27, Canada's first trans pride march was held in Toronto as part of the city's Pride Week celebrations, with hundreds in attendance, including Haligonians. This was a huge step for Canada, and came hot on the heels of the Chaz Bono media frenzy that had many eyes pointed at the fact that Cher has a trans son. From CBC Radio documentaries on transitioning to world conferences in Norway on trans health, awareness has been coming. The addition of "gender identity and expression" to discrimination and hate crime laws in many parts of the world shows an acknowledgement of a previously invisible problem. All this activity is slowly but surely raising the profile of trans topics---topics this city is no stranger to. It's never easy to pinpoint when or how certain communities emerge in a city, but various groups within the HRM have brought the trans community together. A key outfit is Transformers, hosted by The Youth Project on Brunswick Street. It was started in 2006 as a social support group for youth 25 and under. "It's for youth that identify as transgender, transsexual, genderqueer, questioning or anything around gender identity, specifically," says Julien Davis, one of three facilitators for Transformers. The group meets and talks about everything from hormones and hair to family issues, under the guidance of a youth leader, along with adult facilitators. Davis says the goal of the group is "to connect people, to reduce loneliness and to ensure that accurate information is being distributed." Providing sound information on things like surgery, hormones and name changes is essential, says Davis, "because it's difficult to unearth that kind of stuff, and it's intimidating to ask for it." Another group making tracks locally is Trans Family Nova Scotia, founded by Michelle Malette in September 2008. "The group Trans Family is basically a peer support group for families," says Malette. The meetings provide a safe, confidential place for people to talk and share ideas that might help the trans children in their lives. Malette has a daughter who is trans, and found there was a lack of local support groups for families of transfolk. She wanted to open up a space for parents, teachers and allies to support each other in their search for knowledge and understanding. Malette is also the leader for Halifax's chapter of Parents, Families and Friends of Lesbians and Gays. Both PFLAG and Trans Family will be holding an open house in the fall at The Youth Project, and both will be making an appearance in the pride parade---a first for Trans Family. BLT Women of Halifax is a group that welcomes all women with open arms. It's run by four facilitators---Sue Andrews, Karen Clarke, Sharon Chaisson and transwoman Alana Murray. "It's a social empowerment type of group," says Andrews. The group has been running for almost five years to empower women and wanting "to strengthen our own community within instead of having everyone so divided," says Clarke. "Here, we come together as one," says Andrews. One of the highlights for the group is its annual camping trip to Grave's Island, this year from August 21 to 23. "Women are women, totally accepted, period," says Andrews. "We try to be very respectful to each other, as we want to be respected ourselves." The trans resources in Halifax don't end with just support groups. For those seeking a congregation to call their own, many local churches open their doors to the LBGT community. Safe Harbour MCC is a Christian church that has been in Halifax since 1991. It belongs to UFMCC---the Universal Fellowship of Metropolitan Community Churches, which has congregations all around the globe. Bob Fougere, board member and treasurer for the church, says Safe Harbour has about 30 members, 20 to 25 of whom attend services on a weekly basis. "We've identified from the very beginning of our church as being advocates for gay people," he says. "We're a church that ministers mainly to the gay community." Fougere says that for many reasons, there's always been an affinity between the gay and trans communities, and he's looking to expand the services they offer to the latter. He says he knows there are some great resources for trans youth in the city, so he's interested in providing some social space for the adult side. One idea is to set up a movie night or social evening for trans adults, just to allow them the facility and a space to come together. "We'll be doing our best to identify the needs of the trans community, and if we can respond to them, we will---that's what we're about." He encourages anyone who's interested to get involved with them, whether they're spiritual or not. "There's lots of things people can get involved with and not necessarily go to church," says Fougere. "The god stuff is not what people are maybe interested in," he says, noting that it's not a problem. So whether it's support groups, social groups or pride week events that transfolk and trans allies attend, there are no lack of ways to come together locally. Perhaps what's most important during Pride is to feel it---pride, that is. For whatever identity you're proud of. Favourite moment in transitioning: "I think I've had a few occasions where I've gone out for a day presenting as female and have been fairly successful and really happy with myself," says Malette. Profile: Liz Malette's story of transitioning started out as tough as most, but changed considerably when her family lent their support. "I came out to my friends as trans when I was 15," she says. "Then I told my mother when I was 16 and we talked about it with the rest of the family when I was 17. "When I came out, essentially what I did was I left two packages of resources, one for trans youth and one for parents of trans youth," says Malette, who put them in a spot where her mom would find them, "and I left a note and signed it as Elizabeth." of transfolk. She is also the leader and contact for Halifax's chapter of Parents, Families and Friends of Lesbians and Gays (PFLAG). 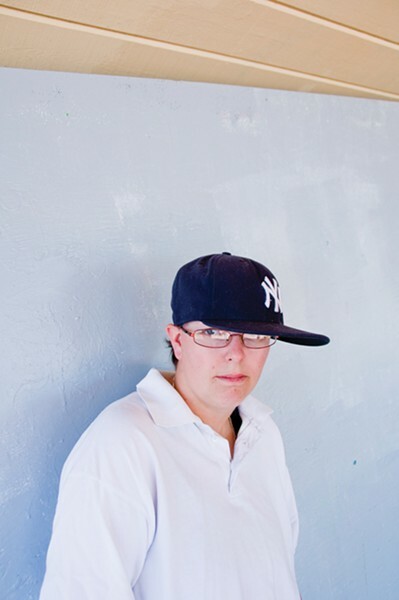 Liz and her mother have presented at various fundraisers and conferences together around the province, educating people on trans topics through accounts of what the last couple of years have been like for them. Many at these events have commented on how powerful their testimonials are. Like many other medical procedures, there are long waiting lists involved in the process of transitioning. After waiting for all the ducks to be in the exact row needed to begin hormone therapy in this province, Malette recently began taking female hormones. "I have been getting slightly more moody and stressed than normal," she says, but comments that despite this it's going well. She's also noticed some minor physical changes. "I think that it's important to remember everything is a process. "I don't think being trans should have to be as difficult as it is," she says. "It's not that difficult to have a gender-neutral bathroom in a place like a mall. I want to make things easier for other people after me that have to transition." Favourite moment in transitioning: "My favourite moment was the first time I wore only a t-shirt out in public since having my top surgery. It was the most amazing feeling to have only a t-shirt on my back and shoulders with no chest binder on---I could stand up straight with a sense of pride at my flat chest. 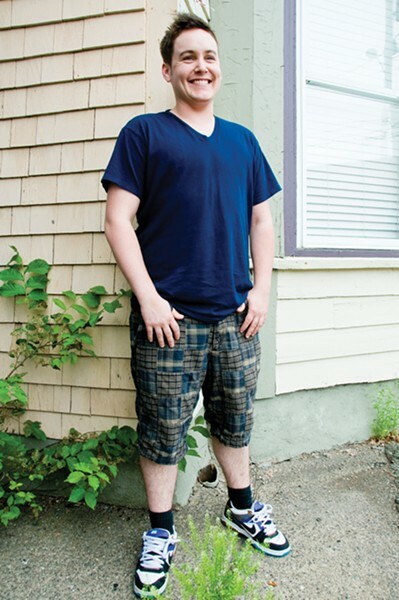 Profile: Davis is a transman who has devoted much of his adult life to helping out other transpeople in this province. 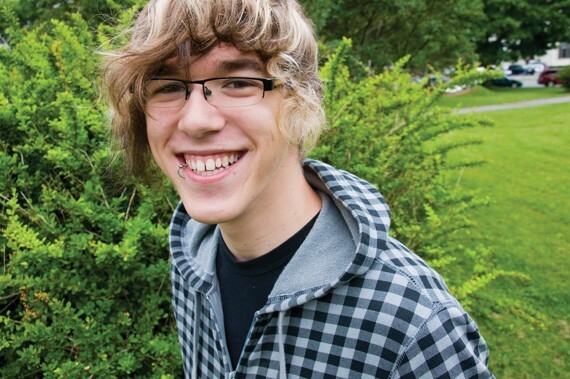 His job at The Youth Project is to provide support to queer and/or trans-youth throughout Nova Scotia. Additionally, he's finishing his Masters of Arts thesis in Women and Gender Studies at Mount Saint Vincent University. His thesis focuses on the trans-inclusion in Women's Studies in Canada. He's regarded as a pillar of strength and hope in the local trans community, but didn't get there without his own journey in transitioning. "Realizing I was trans was a relief," says Davis. "Coming to terms with it was a struggle---coming out had its challenges--but it's all worth it now." He says he's happy for the first time in his life. Davis has "no more indescribable anger and depression---just me being comfortable in my own skin." He admits that being called "he" by strangers still brings a little involuntary smile to his face. "It's like my own body is rejoicing in finally being seen for who it is---me. Me, who happens to be a 'he.'" Davis has been helped through his transition with the "amazing" support he's received from his partner of nine years, Sandra, "and her unwavering strength to pull me up during the darkest times." He's also found strength in the love of his family and closest friends, "who love me no matter what and who continually amaze me with their wisdom." Beyond being encouraged by those closest to him, he adds that he's been strengthened by "such an amazing community of trans and non-trans allies who are making such tremendous changes in this part of the world." For all the support he's received in his life, Davis says he considers himself one fortunate man, trans or otherwise. Favourite moment in transitioning: "The day I found out I was trans," she says. "I figured it out after reading another trans female-to-male story online. It was an echo of my own life." Profile: She says it answered all the whys and hows of her past and helped her better understand the choices she'd made in her life. She's in a happy middle ground in her transition, and points out that transitions don't happen the same way for everyone and aren't like schedules that can be followed. Davies-Cole prefers that people use "Michael," rather than pronouns, but likes to mix things up and so is comfortable with female pronouns if pronouns must be used. "transsexual" and "transgendered"---don't serve much purpose. "I really don't believe in any of the words," she says. "People are now becoming so gender-fluid that we need to rethink the labels that we apply. "I usually tell anyone that asks that I'm a tree, as it has many branches and can grow. If I was to use the terminology out there I would say I'm closer to two-spirited, but I also have intersexed characteristics." The term "two-spirited" is often misunderstood, she says. "There is much more to it then saying, 'Oh, I feel like this or that.' It is something that is way too in-depth to put into a text book." We shouldn't have the right to decide where others belong on the "gender slide," she says, adding that words can often work to label others in ways they aren't comfortable with. Favourite moment in transitioning: Although his transition has been stalled while Keddy saves up for chest surgery, one high point has been the support he's received from his father, who's been very supportive since Keddy came out. His father doesn't use pronouns, Keddy says, he just calls him "Jay." Profile: Keddy knew he wasn't like other girls growing up, but he didn't know what he was until he watched the 1999 film Boys Don't Cry. "I came out when I was 18. I was living in Truro in a group home for girls. When I did come out, it caused a lot of problems. I ended up getting kicked out and having to move home with my dad." Keddy is in the process of scheduling chest surgery and legally changing his name. Until he undergoes the surgery, he says he can't justify taking testosterone and growing facial hair. "I just don't want to have to explain," he says, admitting that he doesn't need any strange looks on the bus. He says he loves doing drag performances with The Suspicious Packages, "because it lets me be who I am, even if it's just for three minutes." Keddy is one of four in the group, which started in April 2008. They do shows regularly in Halifax and around Nova Scotia. He performs under the name Justin Cider, complete with fake facial hair. "When I'm Justin Cider, that's who I am. I'm a guy, I'm called 'he' all the time, there's no mistaking it. I have the facial hair and no chest [from binding], and it makes me feel like who I am." Although Keddy has some very supportive people in his life, it's a struggle for others to understand his experience. He's had a lot of friends who refused to call him anything but "she," and lost them over the disrespect they showed. But on a positive note, Keddy reports that more strangers are referring to him lately as a male, which he finds encouraging as he prepares for physical transitions. He's tired of being unhappy to make others happy, and is ready for change. "I'm getting on with my life and doing what I need to do to be happy now. I'm putting me first." 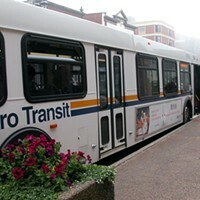 Forget the sound bites you've heard about the five-year transit plan currently under debated by Halifax council. The plan is a good one and moves Halifax in the right direction.